The evolutionary biology of parasite mating strategies is remarkably poorly understood (despite this being a major target for interventions). Male and female sexual stages (gametocytes) must produce gametes and mate in the blood meal of a mosquito for transmission to occur. We are investigating how sexual stages manage to synthesise gametes and mate within 30 minutes of being taken up in a blood meal, which is a very hostile environment. Recent work has produced a 3D holographic reconstruction of the male gamete to document their morphology, speed, and swimming action. This has suggested that males do not locate females by swimming randomly around the blood meal. Indeed, recent work suggests that females are able to attract males by a mechanism such as chemotaxis. Lessons from the male malaria gamete have also overturned conventional wisdom for how flagella and cilia operate – that chirality in the structure of the axoneme governs the beat pattern and explains major developmental phenomena, like symmetry. Cell suicide (apoptosis) plays an essential role in the development and maintenance of multi-cellular organisms. The evolution of cell death in multicellular organisms is readily explained because an individual's cells are clonally related and so have a shared goal in the successful development and maintenance of their ‘body'. For this reason, cell death by genetically controlled processes was assumed only to have evolved in multicellular taxa. 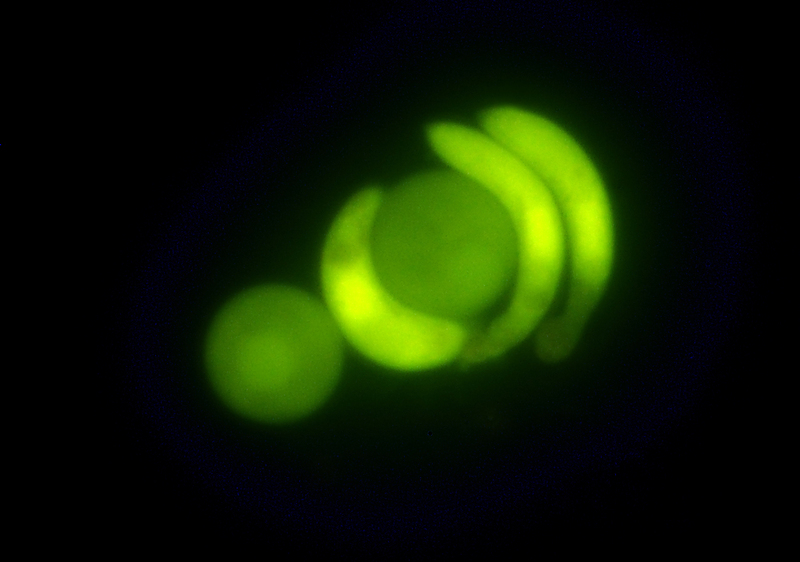 Discovering cell death in unicellular parasites is a puzzle: according to "Darwinian Survival of the Fittest" parasites are expected to evolve strategies to maximise their proliferation not their death. We have suggested that parasites could use apoptosis to "altruistically" self-regulate their number to avoid excessive infection levels that could kill their vectors before transmission to new hosts has occurred, or to reduce competition for resources. These explanations assume that vector survival is negatively related to parasite burden and apoptosis is a co-operative (altruistic) trait because it benefits the surviving parasites. If apoptosis is a cooperative trait it will be more frequent in infections in which parasites are genetically related because parasites should only undergo apoptosis when their actions will benefit their kin. Alternatively, in genetically diverse infections, competition for resources is likely to occur and parasites would benefit from inducing their unrelated competitors to undergo apoptosis. However, multiple markers of genetically controlled suicide have been observed in both mosquito and blood stages of malaria parasites. In the mosquito midgut, fertilised females normally develop into ookinete stages, which penetrate the midgut wall of their vector, encyst, and produce parasite stages that are infective to new hosts. In P. berghei, a number of ookinetes undergo apoptosis like cell death instead of invading the midgut wall of their vector. This phenomenon occurs independently of mosquito and host blood factors and is not unique to Plasmodium parasites; evidence of apoptosis across a range of protozoan parasites (including Leishmania, Trypanosoma and Toxoplasma) is accumulating. We would like to know whether male gametes locate females in the blood meal using chemotaxis, and identify the nature of the costs and benefits of male gamete interactions with red blood cells (exflagellation centres). We would also like to quantify the relationships between apoptosis, parasite density, and the genetic diversity of infections to understand the evolution and maintenance of this trait. Understanding what happens in the mosquito blood meal could reveal novel targets for blocking disease transmission.